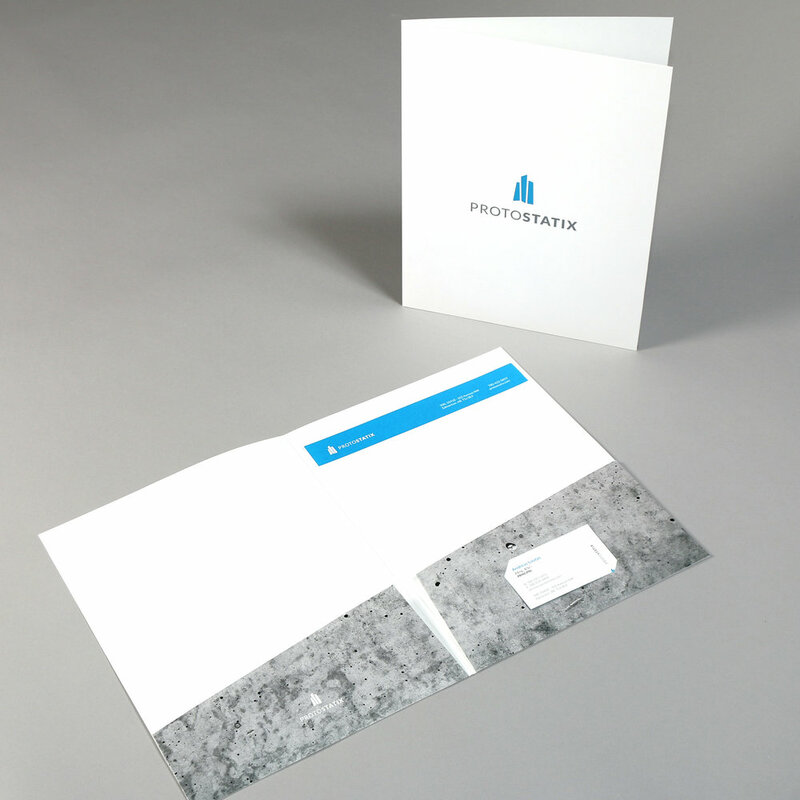 KENNEDY was commissioned by Protostatix Engineering, a well known Edmonton based engineering consultancy, to develop a completely new corporate branding strategy, identity and stepped roll-out plan that would coincide with the new corporate office interiors KENNEDY was designing in tandem with the re-branding. An overall plan and schedule was developed with the client and firm leadership to coordinate an array of complex and moving parts in this corporate make-over. 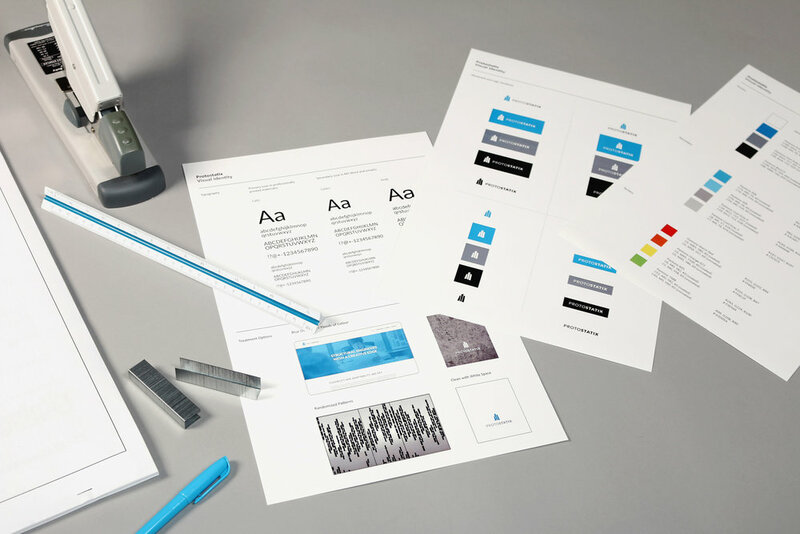 A comprehensive initial brand audit was undertaken, along with an interview process to understand the firms history, and vision and mission for the firms future. All levels of the leadership group were part of these information gathering sessions, and the entire scope of the project spanned approximately 12 months. Brand elements were then introduced at particular phases during the Interior Design process of the new corporate offices to strategically integrate brand elements into the Interior Design. The overall re-brand included a new corporate logo and identity, complete printed and electronic collateral, electronic management & user manual to maintain integrity over time of the brand elements when used by staff, and a completely new Web presence and text articulation of the firm. Vaughan Hoy Studio was commissioned to design a folded two sided invitation for renowned Canadian architect Dan Hanganu's lecture in Vancouver, BC sponsored by Light Resource. 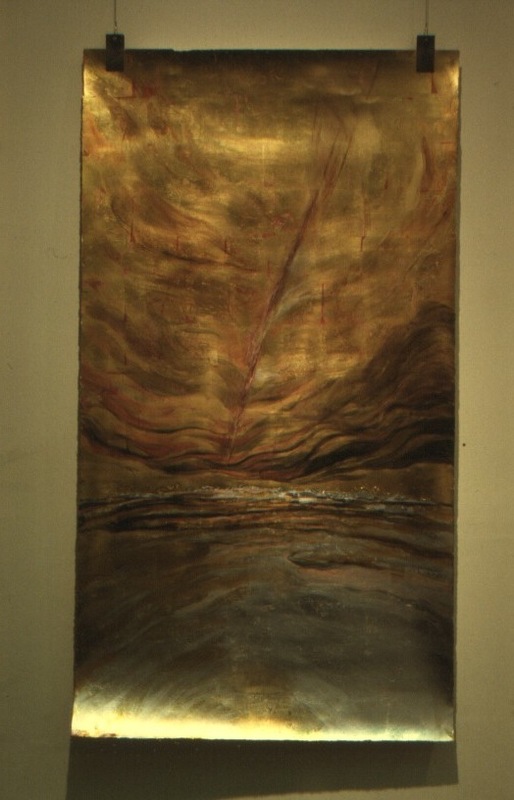 The commission brief was to develop a visual piece that expressed qualities of the natural West Coast environment that were unique and at the same time evoked an ephemeral nature akin to this quality inherent in light. 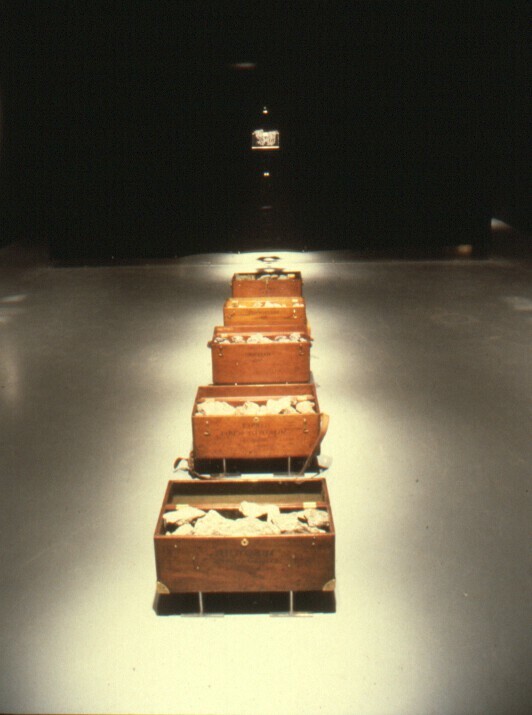 The studio researched aboriginal middens in the Gulf Islands as a uniquely West Coast artifact and the quality of light found in the coastal forests. Printed as one fold out on white cold pressed stock in gold ink the invitation gave off the quality of specularized light. 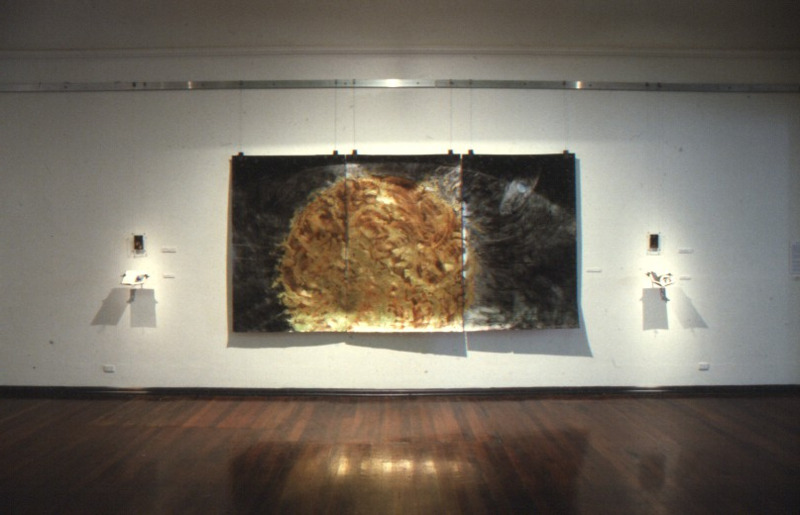 Artist Julie Andreyev in continuing her investigation of the natural world and astrological phenomena mounted a large scale exhibition at the Perth Institute of Contemporary Art in Perth, Western Australia. Vaughan Hoy Studio supported the artists work with exhibition elements design and installation. This body of work consisted of some 40+ art pieces, that would be housed on the entire ground floor of a beautiful two storey 19th century heritage building in the heart of Perth repurposed as PICA. Andreyev's exhibition consisted of contemporary large scale mixed media paintings free hung at the top of each piece, paintings with constructed elements, books and manuscripts, local materials brought into the gallery and plant material. 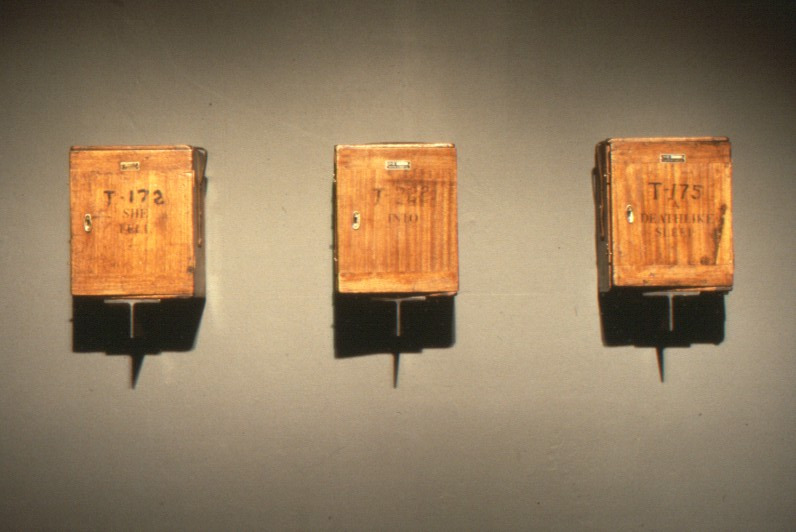 All the exhibition elements were designed so they could be fabricated, crated and shipped inexpensively with the artist in as few containers as possible. 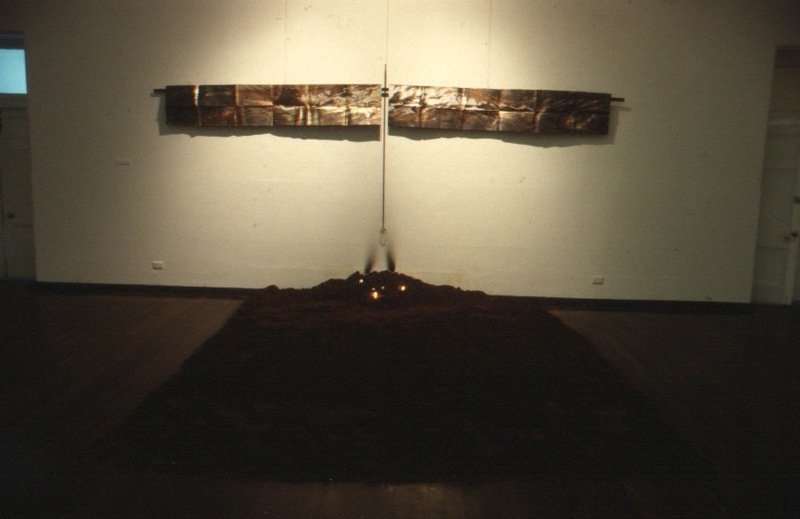 The artists large format mixed media work were transported in rolled form along with crated fittings. 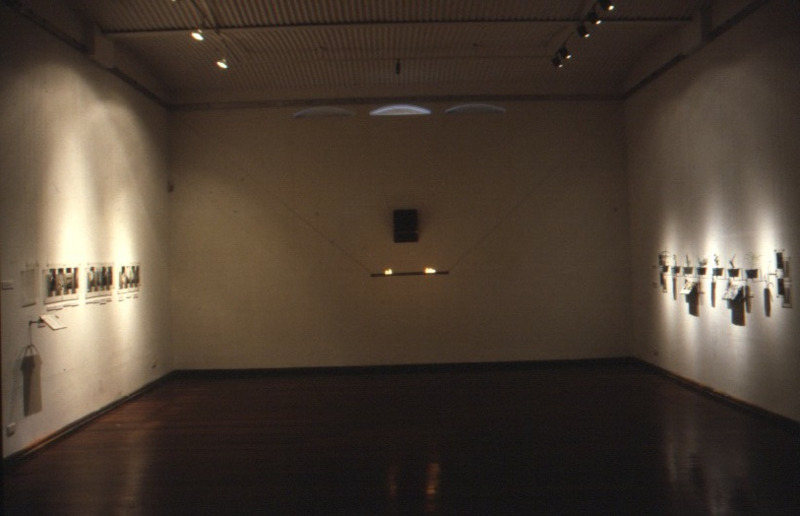 The exhibition works and elements were laid out in the PICA gallery upon arrival to acclimatize prior to starting installation. Components were designed to be as minimal as possible so as to not visually compete or detract from the artwork. Exhibition support design had a quasi scientific instrument aesthetic utilizing mild steel, stainless steel, plexiglass, and steel cable. 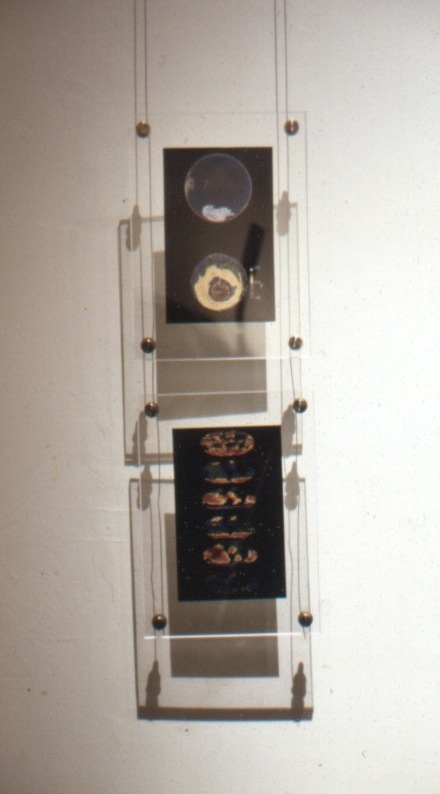 Mixed media paintings were top supported with custom designed steel fittings. Some readjustment of some components were carried out in-situ to fit the unique physical attributes of the space. Artist Julie Andreyev commissioned Vaughan Hoy Studio to design and install support elements for this seminal exhibition at the OR Gallery in Vancouver, BC, and provide photographic documentation of the exhibition. The artists installation used boxed British Columbia minerals, insects and seeds in a rebus of natural forms, converting the gallery into a site merging aspects of natural and cultural, merging the objects of our exploratory desire with some of the devices used in the artists journey, in the seeking. The intent of Andreyev's work was to construct a psychologized taxonomy linking the pathos of objects with the events of personal dissolution. In Katabasis the psychology of the idea of a return-to-basics is converted into a naturalist's minimalism that, although it echoes minimalist practice, takes its main frame of reference from the consciousness-in-the-material-world hypothesis of Rupert Sheldrake. All the natural objects utilized as displays in the exhibition are indigenous to British Columbia. They are boxed samples of the region. 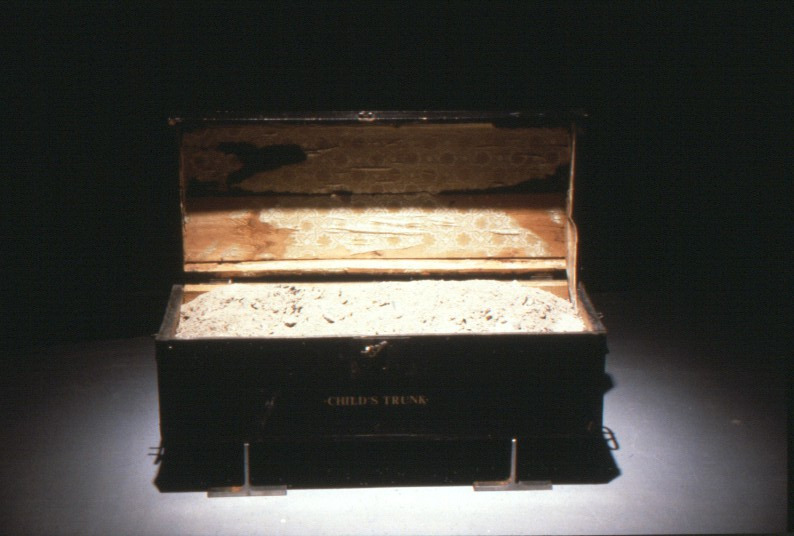 Surveyor's boxes that were once employed to cart the instruments used to plot British Columbia are here forced to hold some of the specific mineral ores that were one of the desired end-points of that plotting. They are the objects linked to the event of exploration, of searching, contributors to myths of progress on the act of taxonomizing the world. 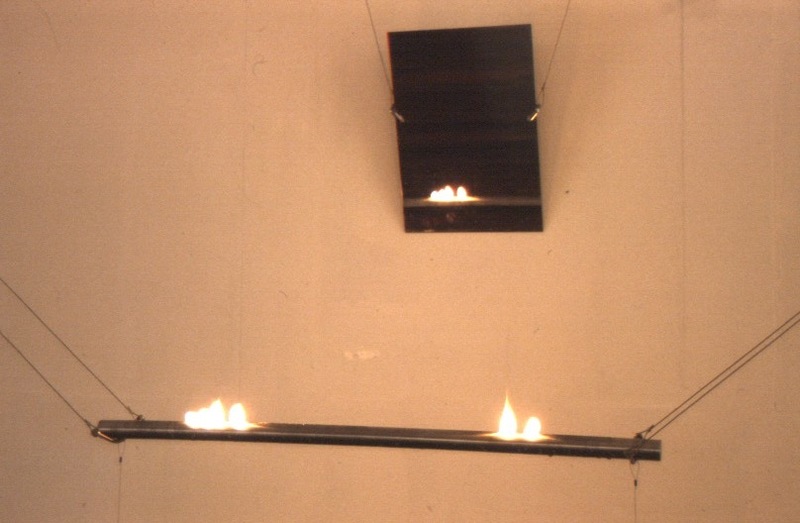 The design objective was to create supports that would put the installation elements in suspension and disappear as much as possible against the art pieces. Utilizing prior insitu-studies of the work of Carlo Scarpa, Vaughan Hoy Studio created sandblasted structural steel shapes designed as floor pedestals, wall mounts, and hanging elements, creating minimalist supports for the artist's artifacts. 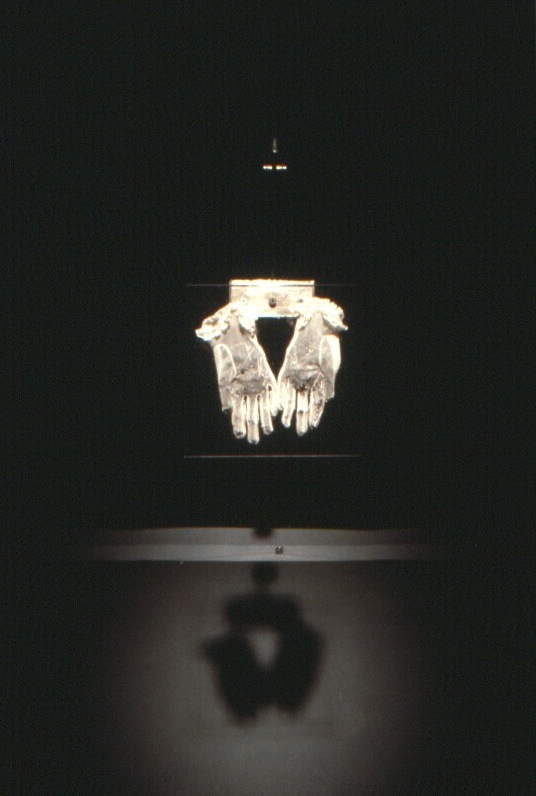 Through careful placement of designed elements, exposing thin edges to create the illusion of minimal support, and playing with dramatic theatre lighting the exhibition had a totally integrated aesthetic physically and conceptually.